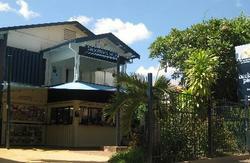 Youth Shack is Darwin's, funkiest & friendliest hostel. Your home away from home in Darwin! We are located in the centre of the Mitchell St entertainment district. We have all the usual facilities of small & large dorms, private rooms with and without ensuite, a fab pool and poolside Bar, a sundeck, pool table, outside kitchen area and full travel desk. When staying 3 nights or more we will refund the arrival part of your airport shuttle. You also receive a free lanyard and re-usable bag on check in! Then there's our staff, not only are they the best looking and friendliest in Darwin but they know stuff. Lots of stuff! Ask them about tours all over Australia and Internationally. They rock and they wont mind telling you! 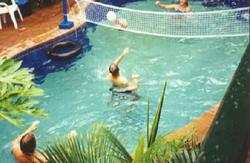 They also offer a free weekly BBQ to all guests with plenty of fun and games in the Pool! If you are looking for a job, then come visit our Job Shack in reception! Youth Shack is located next to the Transit Centre where all greyhound, airport & train transfers drop off.